At Global Football, we’ve heard such sentiment countless times. And, while many prospective travelers will never actually venture overseas under their own steam, those who entrust Global Football with enabling them to live that dream create precious memories that will last forever. As anyone who has traveled abroad knows, these unique memories and life lessons can only be acquired through blending travel and competition, both of which are best experienced by being part of a Team. 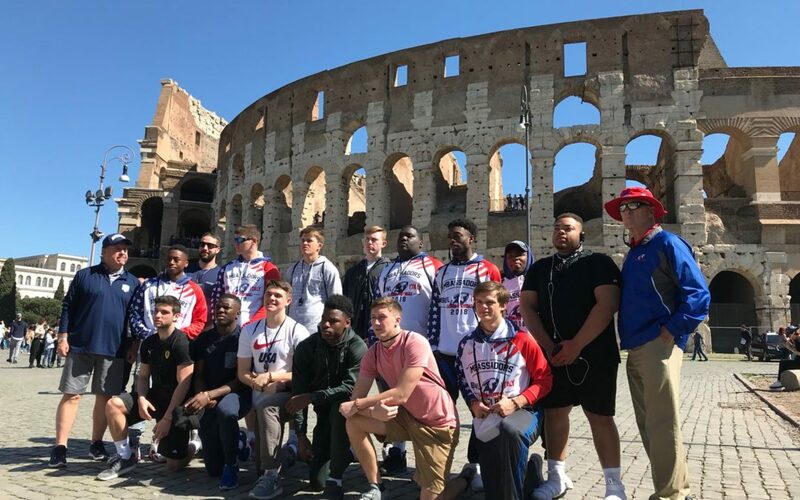 From March 31 to April 8, 2018, we took high school student-athletes from five states to Italy to participate in the 11th Global Ambassadors Bowl. While defeating an all-star team from the Lazio (Rome) region of Italy, part of the Italian American Football Federation, was a highlight, the traveling party will always remember arriving in Rome on Easter Sunday and heading directly to the historic World War II American cemetery of Anzio. Suddenly this part of our world’s past became very real to each individual. Over the next eight days they would enjoy an action-packed itinerary: visiting Naples, the ancient ruins of Pompeii, dining on the side of Mt. Vesuvius, staying three nights in the seaside resort of Sorrento, the famous TreviFountain, the Spanish Steps, the Pantheon and Piazza Navona in Rome. They enjoyed a guided tour of the Coliseum and the ancient Roman Forum, a private Mass in the Irish Chapel of the crypt at St. Peter’s Basilica, a guided tour of the Vatican Museum, the Sistine Chapel and St. Peter’s Basilica. Yes, we make sure our student athletes, parents and coaches experience everything possible during their stay! Among the 28 countries on 6 continents where Global Football has taken intrepid travelers since 1996, China, Japan, Italy, France, Spain, Austria, Belgium and Germany have welcomed members of the high school-aged Team Stars & Stripes for the Global Ambassadors Bowl. Team Stars & Stripes won the eleventh annual Global Ambassadors Bowl, posting a 69-0 win over the FIDAF Regional U19s in Cave near Rome, Italy. Nate Dean caught two touchdowns and scored one of three Team Stars & Stripes interception returns to the end zone, Kavon Carter had two rushing touchdowns, John Washington scored on a catch and a pick-six, John Elliott threw two touchdowns, and Jordan Gyabaah scored on an interception return and threw for a touchdown. Family, alumni and friendsare encouraged to travel to share this once in a lifetime experience with their loved ones and support their son’s team as he represents his country overseas. The players and coaches also give back to their gracious hosts, undertaking community service projects and helping the development of the sport overseas by conducting American football clinics with their opponents. The home teams never mind the sometimes-lopsided score line as it offers them a chance to measure their abilities against more challenging opposition than they are used to facing. And let’s not forget, it is the players, the maturing young men, who are ‘living the dream,’ as we like to say at Global Football, when they travel the world with us. As their horizons expand they are developing into better Global Citizens, ready to take on future challenges in their own lives. “My son Rory was privileged to have the experience of a lifetime when he traveled to China in 2017 with Global Football,” said his mother Colleen Foley. “It was truly an experience he will never forget, meeting players from around the U.S. that he still keeps in touch with, while playing football in China. Rory still talks about the best trip of his life!